Get The Full Picture | Fusion Genomics Corp.
FUSION GENOMICS is developing a pan-pathogen test for multiple infectious diseases that will provide the most “actionable” genomic information for optimal treatment of infectious diseases. The QUANTUMProbes™ in the ONETest™ Pathogenome will be able to identify novel strains that have mutated from reference pathogen strain(s) and will provide detailed genomic information. 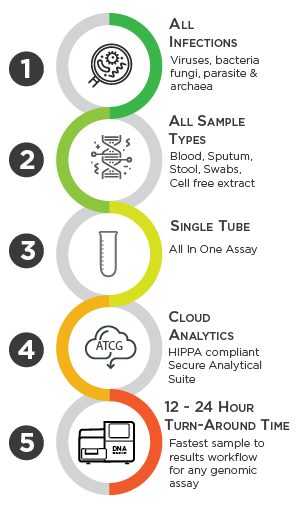 The ONETest™ Pathogenome will deliver on the promise of personalized medicine, will allow detailed and speedy diagnosis of all infectious diseases and will put the power of metagenomic analysis within reach of clinicians. * When using a semiconductor based instrument, all others a preliminary pathogen identification report will be provided at the end of 30 cycles. **Up to 400 samples in one desktop sequencer run.